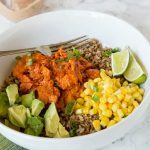 Barbecue Salmon Bowls - Ready in 10 minutes and so easy!! Barbecue salmon over rice with corn, avocado, and a yummy sauce. Pour into a bowl. Top with avocado and corn. Empty salmon pouch into a small bowl, and heat for 45 seconds. Add to the top of the rice. To make the sauce mix all of the ingredients together. Drizzle over the rice bowl.